event on Sunday afternoon, March 30, 2008.
perform under the artistic direction of Joyce Tamesian-Shenloogian. “Hemshen,” in traditional Armenian costumes. Harvard, MIT, Northeastern, Suffolk and Tufts. Tamesian-Shenloogian prepare for the show. 2008 for a Columbia Armenian Club cultural event. 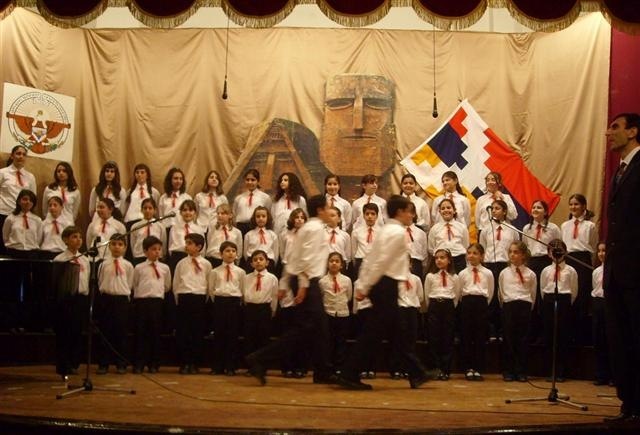 programs, annually serving some 400,000 Armenians on six continents. 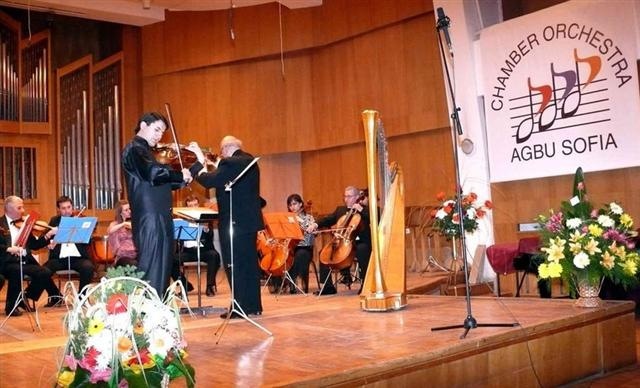 Bulgarian-Armenian talent impressed audiences across the country. Naiden Arsenyan and Hripsi Garabedyan. Petrov, a local town councillor. conductor Bedros Papazyan, performed at the National Academy of Music. Genocide and the centennial of Bulgarian composer Marin Goleminov. Erebouni band and the duo of Anna and Suren Hanamiryan. preserving the Armenian culture in his municipality. With reporting by Prof. Boyanka Arnaoudova in Sofia, Bulgaria. 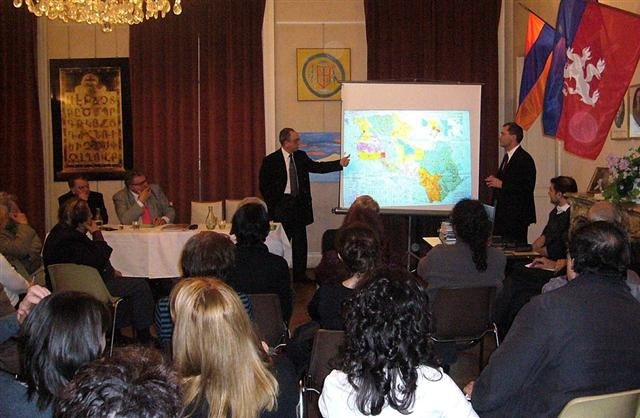 AGBU chapters in the French cities of Paris, Marseille, Valence and Lyon, in cooperation with the Tchobanian Institute, organized a lecture tour entitled “The Foundations for Armenian Security and Means to Ensure It.” The Tchobanian Institute is an independent research center devoted to strategic studies in the South Caucasus, Asia Minor and the Middle East. With the participation of Armen Ayvazyan, director of the Ararat Strategic Research Center and attending professor of Political Science at the American University of Armenia (AUA), the first event took place on April 4, 2008 in Paris, France. More than 150 people attended the event at the city’s AGBU Alex Manoogian Centre. Varoujan Sirapian, president and founder of the Tchobanian Institute, participated in the lecture tour as moderator. Geopoliticist François Thual joined Ayvazyan and Sirapian for the Paris leg of the tour. After a presentation and analysis of the major threats that face Armenia and Karabakh, Ayvazyan discussed the issues facing Armenian-Turkish relations, including territorial sovereignty, demographics, and the strategic importance of the Armenian-populated territory of Javakhk in Georgia. Thual offered a thorough analysis of the issues at hand and suggested that political and strategic concerns excluded the possibility of armed attacks on behalf of Azerbaijan and Turkey on Armenia. 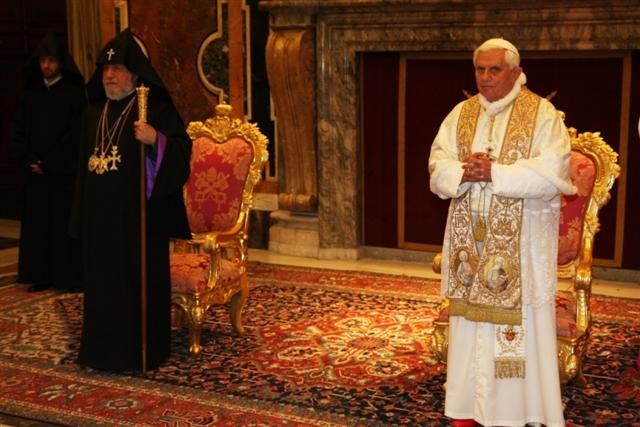 He said the real danger facing Armenia was the shrinking population, which is in stark contrast to the rapidly increasing population of neighboring Azerbaijan. The presentations were followed by a question-and-answer period when members of the public asked about Armenia’s demographic crisis, as well as the current post-electoral situation in Armenia. Among the distinguished guests attending the Paris lecture were Alexis Govciyan, president of AGBU Europe, Nelly Tardivier-Henrot, commissioner of last year’s “Year of Armenia” celebrations in France, AGBU leaders, local Armenian clergy, community leaders, and French-Armenian youth. The tour continued on Tuesday, April 8, at the AGBU Centre in Marseille and was attended by approximately 100 people. Michel Guéviguian, vice-president of AGBU Marseille, introduced the event and Robert Der Merguerian provided translation assistance throughout the evening. On Wednesday, April 9, Ayvazyan and Sirapian traveled to Valence in southeastern France to speak to an audience of 100 at the local AGBU centre. Philippe Panossian, president of AGBU Valence, welcomed the audience that included members of the local town council, former AGBU Valence leaders, as well as representatives of various French-Armenian organizations. The final stop was on Thursday, April 10, at the AGBU Centre in Lyon. Attended by more than 80 people, the Lyon event was hosted by Michel Sandjian, president of AGBU Lyon. This lecture tour is the latest in AGBU Europe’s continuing program of conferences and debates on the geostrategic questions concerning Armenia within the framework of European institutions. Established in 1906, AGBU (www.agbu.org) is the world’s largest non-profit Armenian organization. 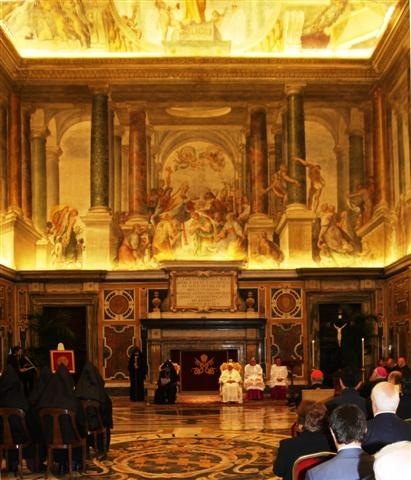 Headquartered in New York City with an annual budget of $34 million, AGBU preserves and promotes the Armenian identity and heritage through educational, cultural and humanitarian programs, annually serving some 400,000 Armenians on six continents. Armenian_Security_Lecture_Lyon01.jpg: A view of the “The Foundations for Armenian Security and Means to Ensure It” lecture in Lyon on April 10. The event was jointly organized by AGBU and the Tchobanian Institute. will continue to prosper into 2008 and beyond. by professors, students, and members of the Egyptian-Armenian community. USD) to defray the center’s expenses. children were delighted by the groups’ cheerful songs and dances. (approx. 2,000 USD) to the Cairo Children’s Cancer Hospital. presentation about AGBU’s growing list of youth programs in Armenia. Boghossian School on February 24.
financial difficulties that have arisen. troupe, and a poetry recitation by Nora Koehnelian.